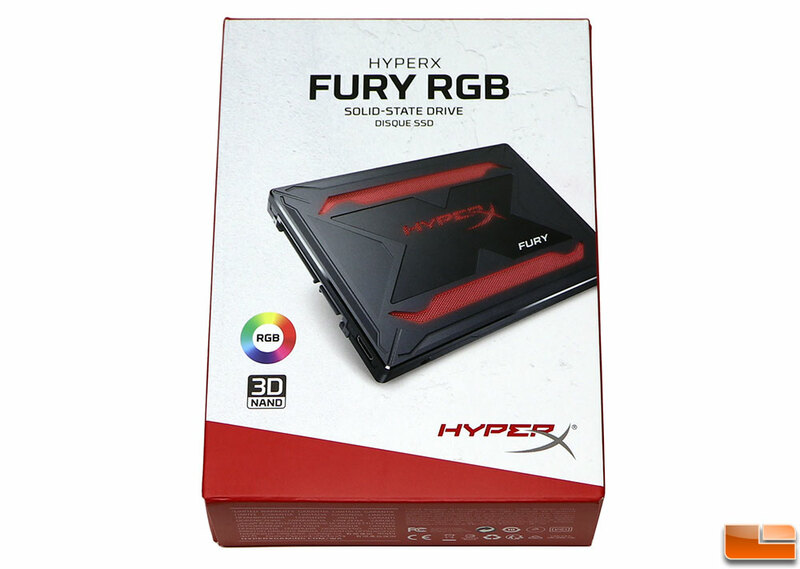 Legit Reviews Reviews HyperX Fury RGB SSD 480GB Review – Bling Your SATA SSD Out! 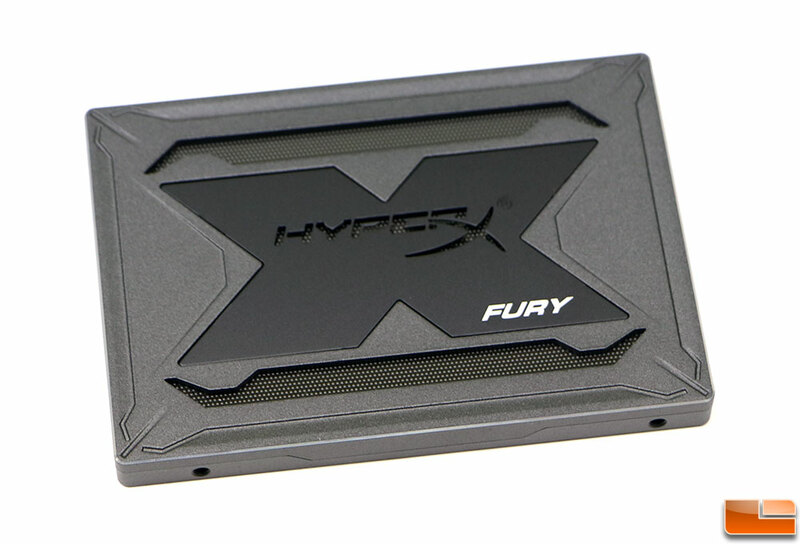 HyperX Fury RGB SSD 480GB Review – Bling Your SATA SSD Out! Inside, HyperX is using a Marvell 88SS1074 controller that has been paired with Toshiba 64-layer 3D NAND (BiCS3) TLC NAND Flash. This controller was first announced in 2014 and over 50 million were sold in the first 18 months that is was available. We don’t know how many millions more have sold, but more and more drives are using it and more importantly it has proven to be reliable. Kingston uses this same controller and TLC NAND Flash on the UV500 series (our review), so this is a combination that we have seen before. We tossed together a quick table below that shows you some of the differences between these two lines that are each ultimately offered by Kingston Technology Corporation. While the drives share the same base hardware, the specifications for the two drives are different as is the price. It should be noted that Kingston measured the power consumption of the HyperX Fury RGB SSD with the RGB lighting turned off. We were seeing over 3 Watts at idle with the RGB lighting on. The top of the HyperX Fury RGB has aggressive styling that looks pretty slick. You’ll want to make sure that you position it into an enclosure that allows you to see the top of the drive from the outside. 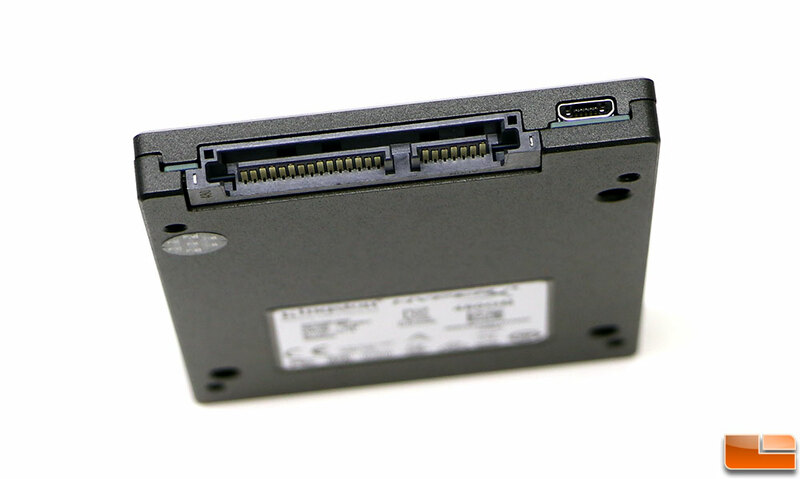 On the end of the drive you have the usual SATA power and data ports as well as a USB port that goes with the supplied RGB cable that will allow you to control the drives RGB lighting on supporting motherboards. If you don’t use this cable the drive will default to red and the LEDs will remain on at all times. The HyperX Fury RGB SSD has a thickness (z-height) of 9mm and the included RGB cable is 32-inches in length. Let’s take a quick look at a video by HyperX that shows the HyperX Fury RGB SSD lighting and then jump into our benchmarking. To benchmark the HyperX Fury RGB SSD we’ll be using an Intel Core i7-8700K processor on an ASUS Z370-F Gaming motherboard (UEFI 1002) running Windows 10 Professional 64-bit v1803 with all available patches and updates. The first benchmark that we ran was CrystalDiskMark, which is a simple and free storage benchmark utility that is one of the most widely used today. CrystalDiskMark v6.0.1 showed that the HyperX Fury RGB 480GB SSD topped out at 560 MB/s read and 520 MB/s write in the sequential tests that are done at QD32. 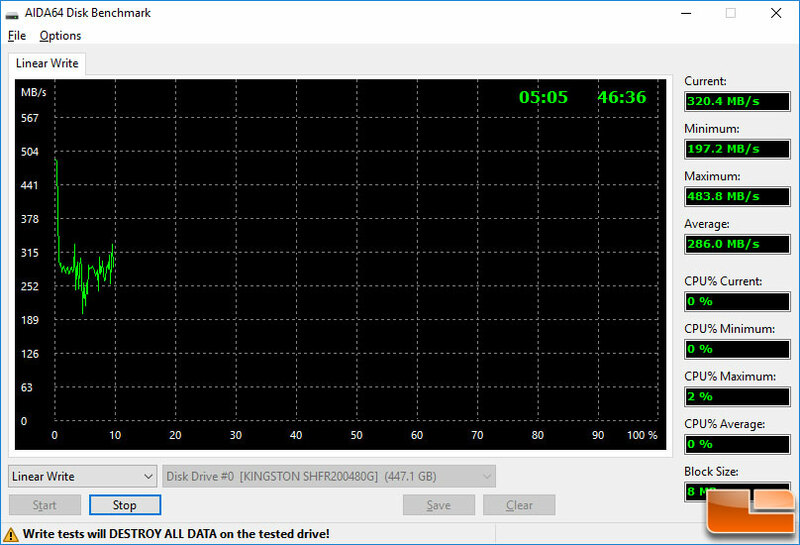 This exceeds the drives factory speed ratings of 550/480 MB/s! The Kingston UV500 480GB SSD topped out at 540 MB/s read and 514 MB/s write, so the Fury RGB SSD pulled off faster sequential write speeds despite being slower on paper. Next, we ran ATTO Disk Benchmark and the HyperX Fury RGB 480GB topped out at 533 MB/s read and 506 MB/s write. The Kingston UV500 480GB drive hit 514 MB/s read and 506 MB/s write, so this benchmark showed that both drives have very similar performance. The last performance benchmark that we ran was Anvil’s Storage Utilities and on that benchmark we got an overall score of 4,178.61 points on the Fury RGB and 3,876.09 on the UV500. 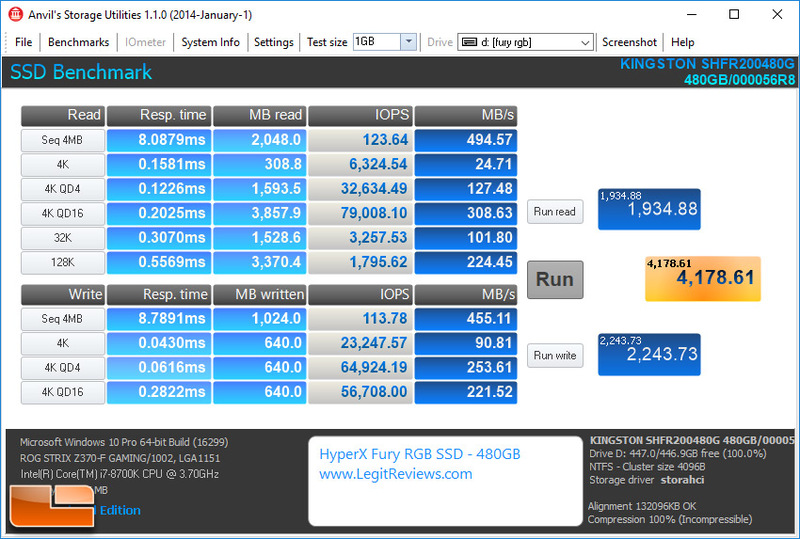 So, all three of these quick benchmarks show that the HyperX Fury RGB SSD was a slightly better performing SSD. 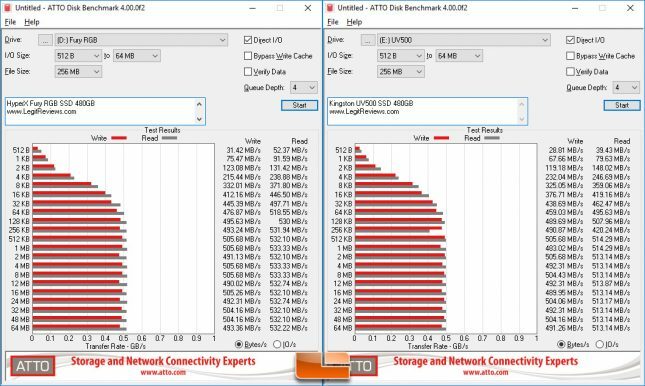 When it comes to sustained sequential write performance we used the linear write test in AIDA64 to see what happens when you force the drive to write data to the TLC NAND Flash without any breaks. The Fury RGB has some of the TLC NAND Flash programmed to operate as SLC cache and as you can tell from the results above less than 10GB of the Fury RGB 480GB drive is reserved as SLC cache. That means once you fill the SLC cache the performance will suffer as we saw performance drop below 200 MB/s for a bit, but it was mainly around 275 MB/s to 300 MB/s. This is common on entry-level TLC NAND drives once the SLC buffer is filled. 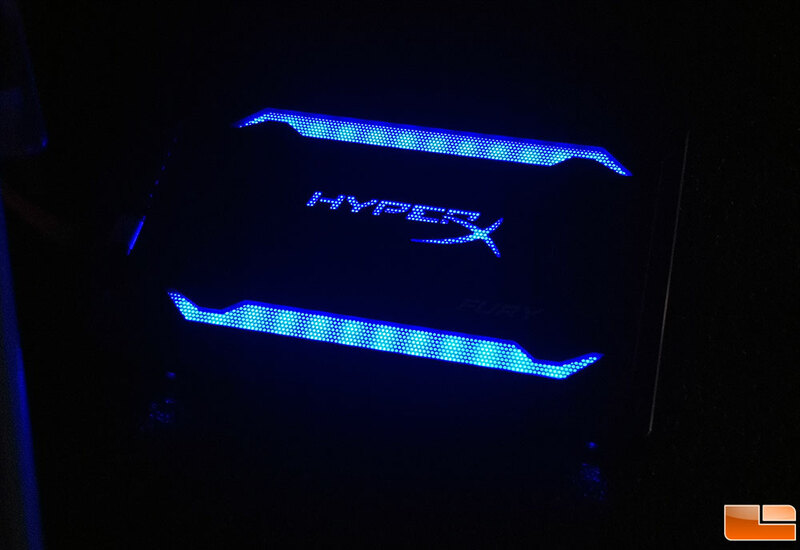 When it comes to the RGB lights we had a mixed experience with the HyperX Fury RGB SSD. When we wired up the HyperX Fury RGB SSD to our SSD test platform that uses the ASUS Z370-F Gaming the ASUS Aura software v1.06.95 (09/11/2018) could not find any compatible devices. The RGB Lighting on the HyperX Fury RGB SSD were bright white and the drive temperature shot up to 70C and was still rising when we shut down the system. So, be cautious if you are running an ASUS board with this drive until ASUS Aura gets updated. 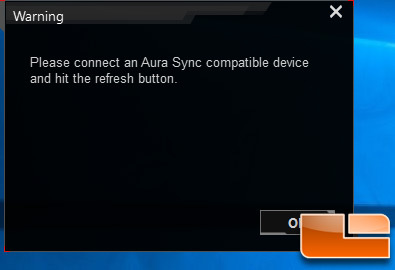 Despite running into issues with ASUS Aura Sync, Kingston lists compatibility with ASUS Aura Sync, Gigabyte RGB Fusion, MSI Mystic Light Sync, and ASRock’s Sync applications. We then switched over to the Gigabyet Z370 AORUS Gaming 7-OP motherboard and downloaded RGB Fusion B18.0919.1 (09/19/2018) and it worked perfectly on all six lighting modes. The default RGB color is red, but as long as your platform supports RGB lighting you should be able to easily change that to whatever color you like. You can also daisy chain the Fury RGB SSD with other RGB devices to sync all of them together. While using the RGB lighting software applications and noting the high temperatures we started looking at temperatures a little closer and it is clear that RGB lighting drastically increases drive temperatures. The Kingston UV500 would idle at 25C and then reach 34GB when we copied 27GB of data to the drive without interruption. The HyperX Fury RGB actually ran cooler at idle with the RGB lights off, but when we turned the RGB functionality on the temperature jumped from 24C to 51C. When we ran the 27GB file copy to the Fury RGB SSD the temperature increased just slightly up to 54C. So, once the RGB lighting is enabled the Fury RGB SSD will run hotter that one might think. The Fury RGB SSD is the first SSD from HyperX to offer RGB LED lighting to PC builders that want to have controllable LED lighting on a Solid-State Drive with good performance. All three capacities that are offered in the Fury RGB SSD series are rated at 500/480 MB/s when it comes to sequential read/write performance and we were able to hit 560/520 MB/s on our 480GB drive. HyperX does not give Random 4K performance numbers, but we were able to hit just short of 80,000 IOPS read and 60,000 IOPS write on the 480GB test drive and that is respectable for a SATA III drive. 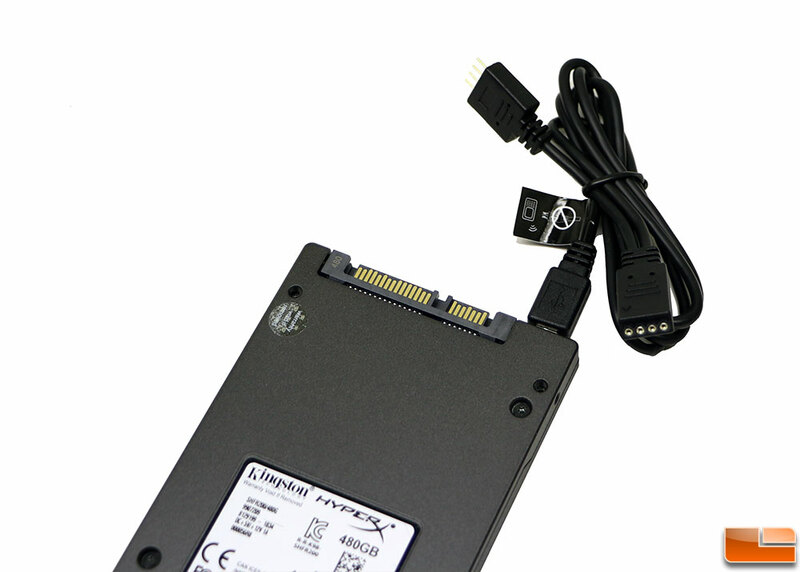 So, on the performance front the HyperX RGB SSD offers the performance one has come to expect from a 2.5″ SATA drive. 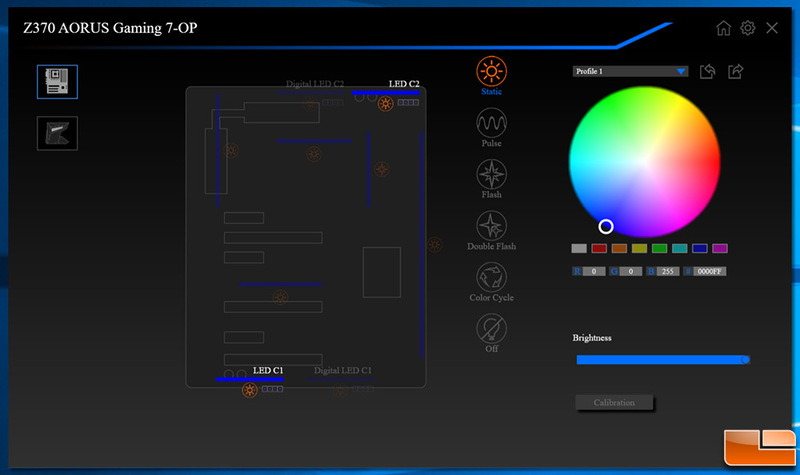 Using the RGB LED Lighting is very straight forward when you use it on a platform that fully supports it. 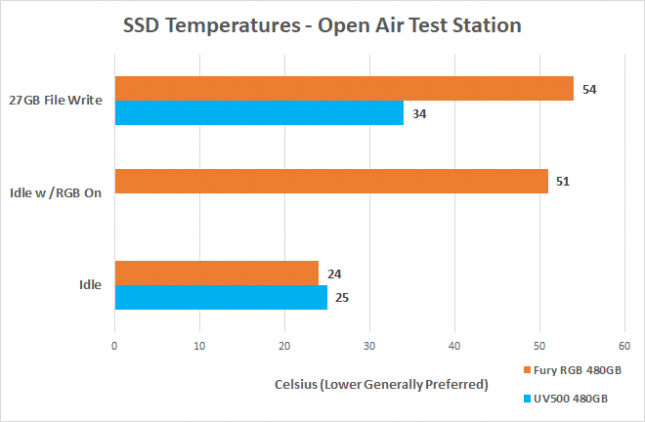 The only big surprise with RGB on an SSD was how it increased the drives reported temperature by over 20C at both idle and during file transfers. The HyperX Fury RGB wasn’t overheating or thermal throttling and we know that NAND Flash loves high temperatures, but we feel this is something worth pointing out as the SSD was now by far the hottest component in our water cooled test system. When it comes to pricing the HyperX Fury RGB is available as of today for $74.99 for the 240GB model, $124.99 for the 480GB model and $219.99 for the 960GB model. The Kingston UV500 SSD series doesn’t have RGB lighting, but has encryption and a longer 5-year warranty. Priced for the UV500 drives are $62.25 for the 240GB model, $103.35 for the 480GB model and $238.64 for the 960GB model. So, if RGB isn’t your thing you can save a few bucks and go for the UV500 series. Legit Bottom Line: HyperX designed the Fury RGB SSD series to appeal to gamers looking to boost the visual appeal of their gaming PC and it is not aimed at those looking for the fastest drive around.